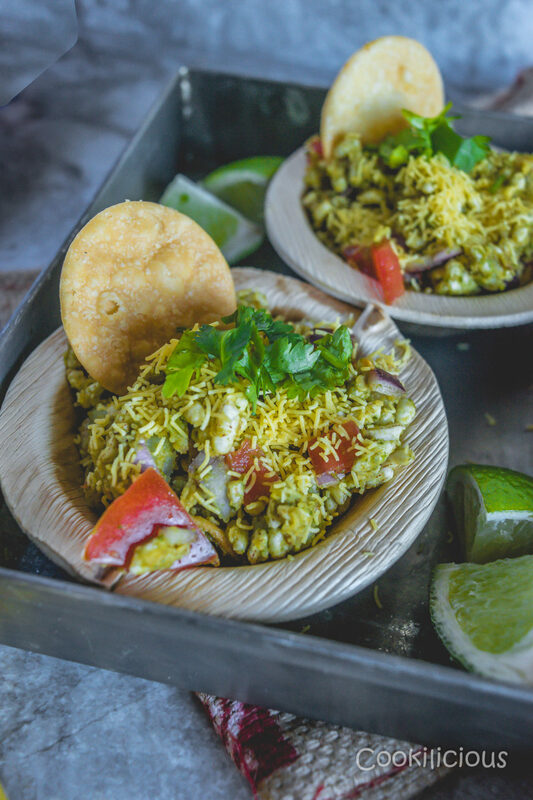 Ask a Mumbai girl how to make this lip smacking vegetarian/vegan snack called Bhelpuri! Made with puffed rice, sev, veggies mixed with hot and sweet chutneys to spice it up is an extremely popular street food from Mumbai. 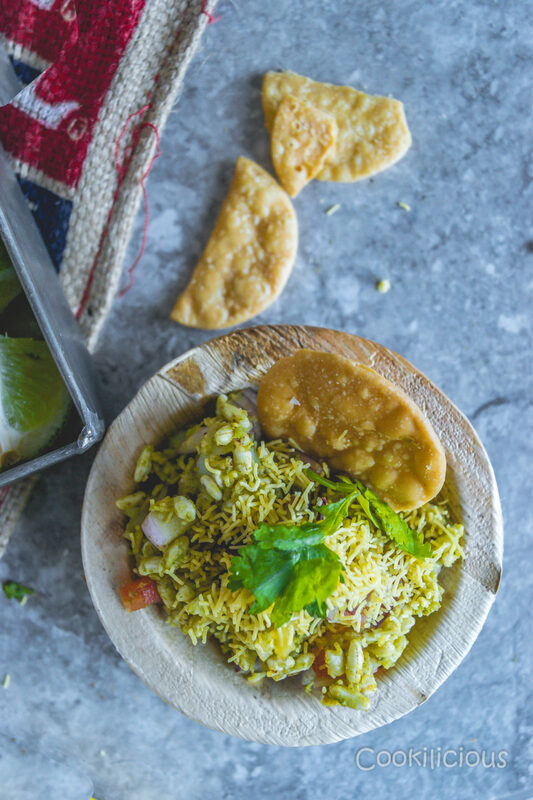 Bhelpuri is an easy to make crunchy Indian Chaat usually taken as an evening snack. I miss my dad everyday but today its worse because I am sharing with you our (his and mine) favorite evening snack recipe. Bhelpuri and us go a long way. It has kept us company on many evenings. We had a street food vendor who would visit our colony every evening without fail. 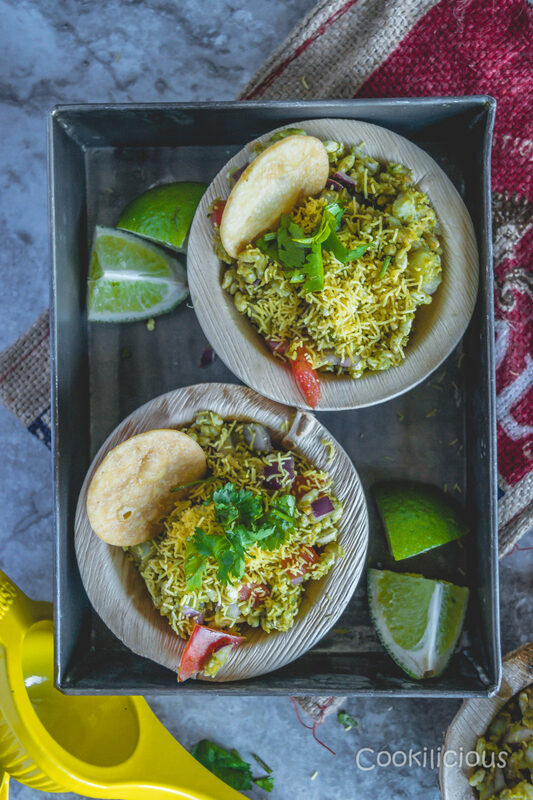 His job – He carried a small cart with him where he stored all the ingredients needed to make this lip smacking snack – Bhelpuri. Come rain or fall, he would arrive sharp on time every evening to sell his food and all of us would gather around him to place our order. If I am at home, I didn’t have to worry that I would miss him, he would ring my doorbell to ask if we wanted to order! Aah, those little perks of living in Bombay! Many times, my dad would arrive home with 2 parcels in hand. One for himself and one for me. My mom and brother would occasionally devour it unlike both of us who would want to eat it nearly every day. I love the memory of us sitting in our living room, relishing bhelpuri which has been neatly wrapped in a newspaper and discussing each other’s day. His bhelpuri never failed us. It tastes the same even today. While my dad would prefer the slightly milder version, I would always order the theekha (spicy) bhel. I would have water running down from my nose, eyes, everywhere but still want to eat it till the last bite. He would always serve it with a papdi which was used like a spoon to eat the bhelpuri and after finishing mine, I would give dad my papdi. It was like some silly custom. My dad always got bhelpuri for me even on days when we would have argued over something, he would be home with 2 parcels in his hand and we would eat it quietly that evening. Ain’t it strange that certain foods evoke a certain emotion within you and connects with you forever? Bhelpuri is one such snack for me that brings out lots of pleasant memories but with a heavy heart and moist eyes. 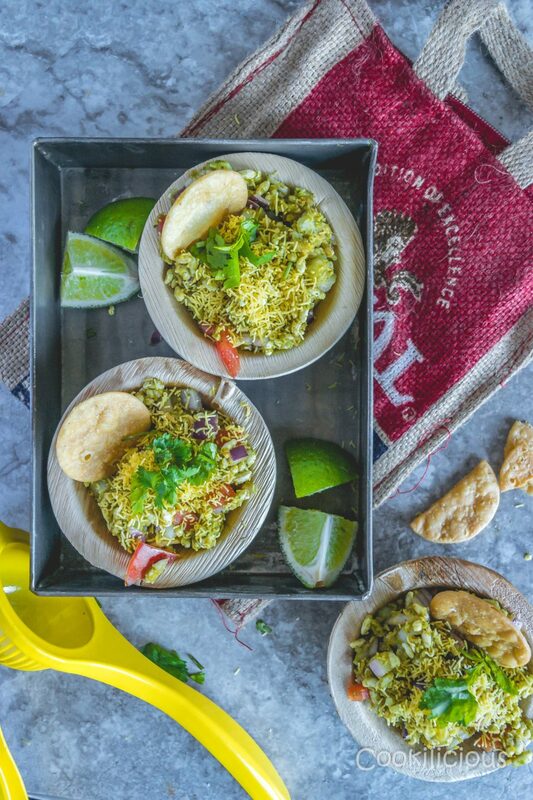 Now some little Wikipedia about Bhelpuri – There is no clear mention of when and where bhelpuri was first prepared, but it likely originated in cafes and street food stalls of Mumbai. Bhelpuri belongs to the family of chaats, which are salty and spicy snacks sold on carts throughout India. It is also our snack food when on the beach. We even like to have it for dinner sometimes as it is pretty filling. 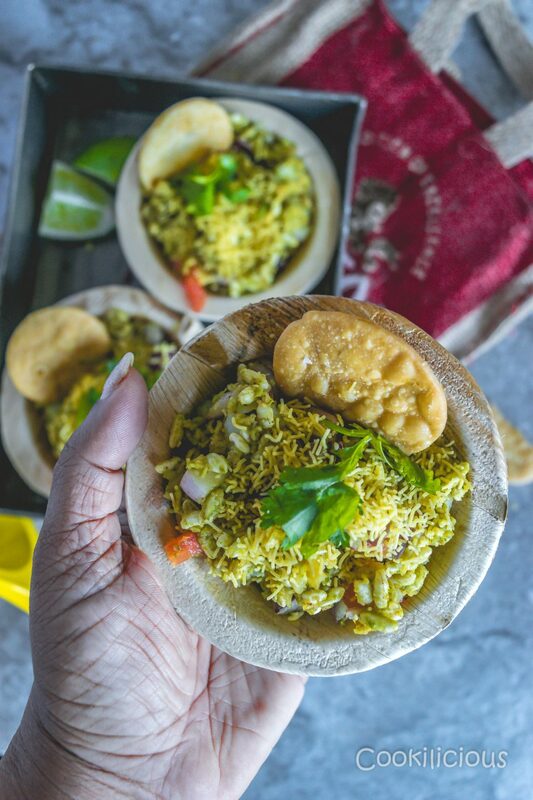 Bhelpuri can be served in many interesting ways, like it is usually served in a paper folded in the form of a cone and is consumed using a paper spoon or by the papdi which is itself an edible component of the bhelpuri or it is put on a plate. You need to eat bhelpuri at least once in your life if not everyday to know what it tastes like!
. Mince green chillies and cilantro. Prepare spicy green chutney and sweet tamarind chutney. You can prepare the chutneys a few days before and store them in the refrigerator. Once all this is ready, its time to assemble the bhelpuri. In a large mixing bowl, add puffed rice, onions, tomatoes, green chillies, spicy green chutney, sweet tamarind chutney, potato cubes, cilantro, lime juice, nylon sev, crushed papdi, chaat masala and black salt. Using a wide spoon or a wide spatula, mix thoroughly until all ingredients are combined fully. The next step is kind of pivotal – taste testing! Adjust the ingredients according to your palate – how spicy, sour, sweet you want your bhelpuri to be, make it so! Garnish with generous amount of sev and coriander leaves before serving. To keep its authenticity, serve it in paper plates/bowls with a papdi on the side. To get the maximum out of this dish, always make it fresh. Stale or soggy bhelpuri is a failure and we don’t want that. The idea is to keep all the ingredients ready and mix it all together when its time to eat. As I dig into my bowl of bhelpuri today, I am transported back to my childhood days where a little girl with innocence in her eyes and smile on her face is sitting with her dad enjoying this snack. This is the memory I would like to keep forever. Love you Appa. If you do try this recipe, please do share it with your friends on Facebook, Twitter and Pinterest. This will keep me motivated to develop more interesting recipes. Click a pic and post it with the hashtag #cookiliciousveg . I would love to see your pictures on Instagram, Facebook and Twitter! Boil, peel and cut potatoes in cubes. Chop onions and tomatoes finely using a chopper. Mince green chillies and cilantro. Prepare spicy green chutney and sweet tamarind chutney. You can prepare the chutneys a few days before and store them in the refrigerator. Once all this is ready, its time to assemble the bhelpuri. 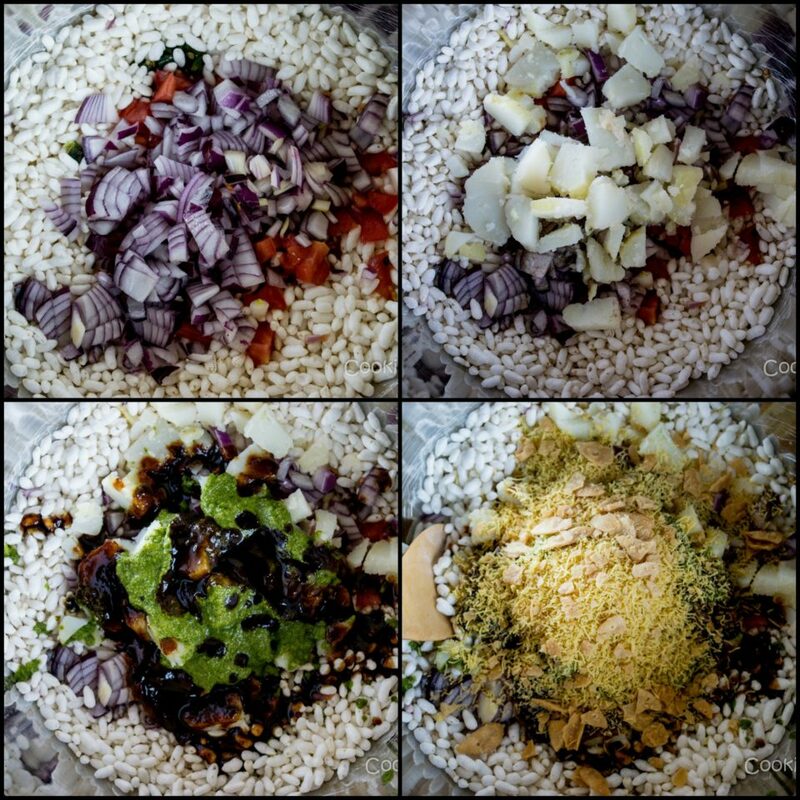 In a large mixing bowl, add puffed rice, onions, tomatoes, green chillies, spicy green chutney, sweet tamarind chutney, potato cubes, cilantro, lime juice, nylon sev, crushed papdi, chaat masala and black salt. Using a wide spoon or a wide spatula, mix thoroughly until all ingredients are combined fully. The next step is kind of pivotal – taste testing! Adjust the ingredients according to your palate - how spicy, sour, sweet you want your bhelpuri to be, make it so! Garnish with generous amounts of sev and coriander leaves before serving. To keep its authenticity, serve it in paper plates/bowls with a papdi on the side. To get the maximum out of this dish, always make it fresh." Mumbai street food varieties are endless. I can only aim to cover maximum of it. While I still have a long list to complete,here are few that I have covered already – Sev Puri Grill Sandwich, Vada Pav, Pav Bhaji Masala, Dahi Ragda Puri, Black Chana Chaat, Spicy Sweet Potato Tikki With Chole Chaat, Vegetable Frankie, Potato Paneer Kathi Roll/Wrap, Mushroom Kalan Masala/ Mushroom Stir Fry, Samosa, Masala Dal Vada/Lentil Fritters Mysore Masala Dosa and Potato Capsicum Grill Sandwich.